One more sugar-free granola recipe to add to the list, still with chocolate, but with a different texture and much more chunks than the previous recipe. 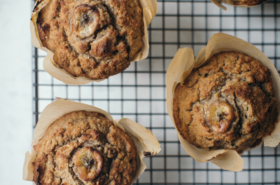 No need to add sweeteners as honey or maple syrup to get this result: banana, coconut oil and Tahini do it all and give to this Banana, sesam & chocolate monkey granola its yummy side. 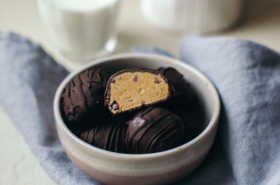 I wanted first to use peanut butter instead of Tahini, unfortunately I already finished it in other recipes – and the vital pronostics for a peanut butter pot in my cupboard are usually not very high…-. 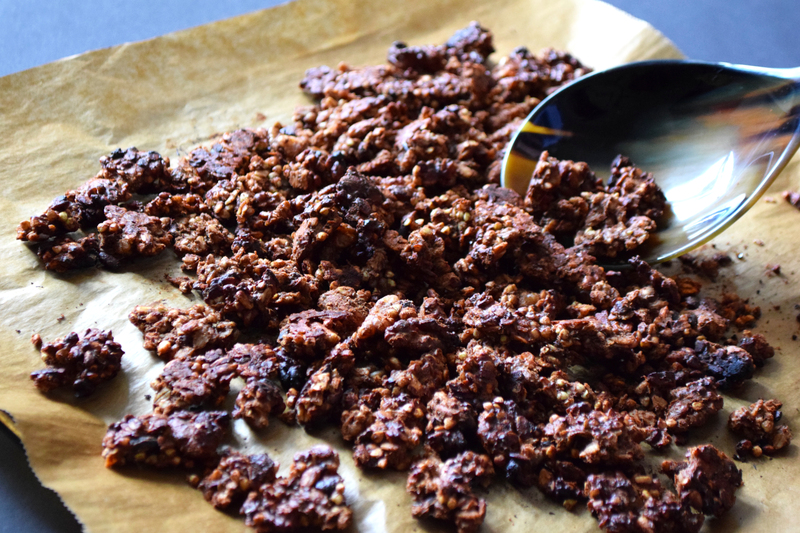 I feared that the sesam get the upper hand on the other ingredients in this granola recipe, but its taste is finally quite discret along banana and raw cacao. It fits perfectly topped with a greek yoghurt and some oven-roasted rhubarb, or with soy milk and a few berries. 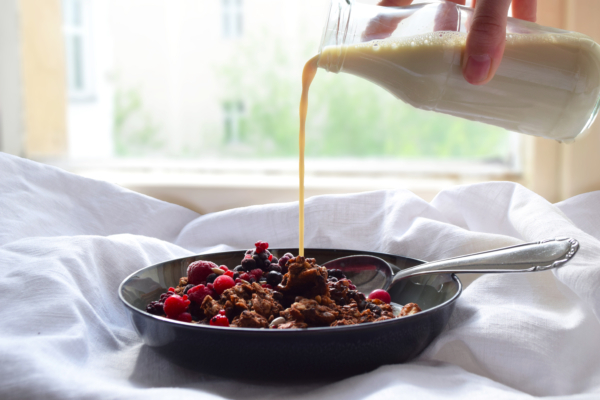 However I would avoid to top a smoothie or banana ice-cream bowl with it, because even though it’s a sugar-free granola, its fructose content is already enough. 1. Preheat the oven at 180C. Mix the dry ingredients in a salad bowl: oats, buckwheat, walnuts, almonds, raw cacao nibs, chia seeds, vanilla and salt. 2. In a bowl, smash the bananas with a fork. In a small pan, let melt the coconut oil on a low heat, then add the raw cacao powder and the sesam paste. Stir well to get a homogeneous and smooth texture, looking like a banana compote. 3. Pour the banana compote on the dry mix and stir well the whole in order to coat everything with the liquid mix. 4. Arrange the granola on a baking tray, covered with a baking foil. Flatten well and put in the oven for about 20 minutes. 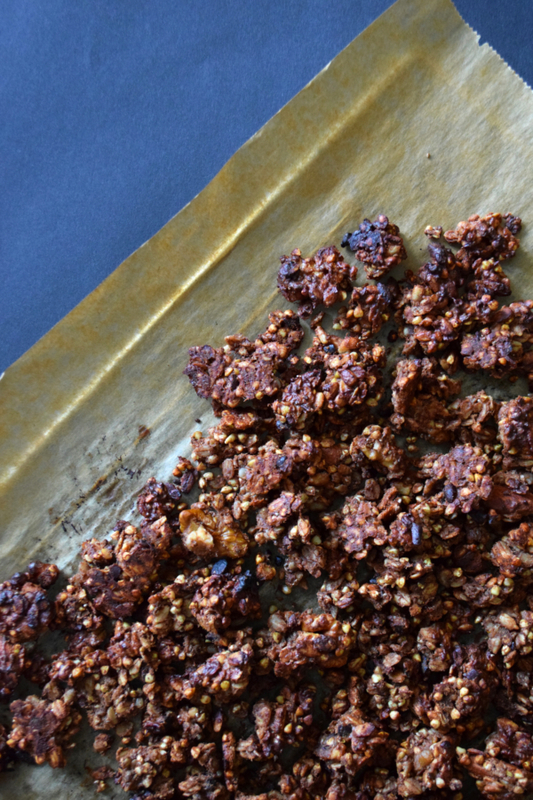 Break some chunks halfway and turn them to obtain a granola homogeneously baked. Let cool down and store a few days in a hermetic pot. Thank you Bethany! 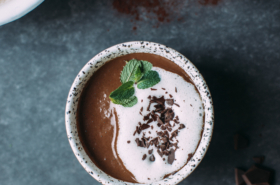 Just made the same version this week, but without cacao powder and damn it’s even tastier! Made 2 batches and ate both in less than 2 days..oops!